It is not easy for me to criticize an American president, irrespective of his ideological background, because when I do, my criticism often get used by all sorts of anti-American forces in the Arab World, and beyond, in their attack against America and American values, that is, the very values which I long came to embrace, albeit always critically. For, to me, America is an idea, a worthy idea, whose advancement requires critical adherence not blind faith, and armies of analysts and scientists not militias and informants. My long-standing claim that our interests in the Broader Middle East and North Africa region are harmonizable with those of America and the West is also undermined by this. I often encounter the same situation whenever I criticize Islam and Islamism, as my criticism get sometimes used by fascist elements in the West in their bigoted campaigns against the Muslim populations in their midst. But I cannot simply decide to shut my mouth or restrict the venues where I can speak out when so few of them are available to me to begin with. Rather, I simply have to be aware of the unintended consequences of my speech and should attempt to alleviate them by addressing them when I can and not avoid the issue. This situation often leaves me with few political allies, as people on both the Right and Left find it difficult to classify or even approach me. Even those who respect my stands and appreciate the nature of my dilemma are often only willing to voice their opinions in this regard privately. There are exceptions here of course, and to these exceptions, I will forever be grateful. But, politically, I often end up in hot waters, and isolated. I can’t be on the Left, I can’t be on the right, and being independent means little in practical terms, because politics is all about organization and coming together around some common cause, no matter how provisional the basis. That’s why I always speak in defense of the right to heresy, not the right to apostasy, both in the religious and political sense. Because to me, apostasy is a personal conclusion, but heresy is the beginning of the journey. If people can accommodate themselves to the prevalence of heretical views and accept the right to heresy, then, they would expect that, to some, heresy is bound to ultimately lead to apostasy, and, thus, end up endorsing the right to apostasy as well. This might sound counter-intuitive to many people. And, in a sense, it is. For most people seem more inclined to believe that, if the faithful can be convinced of the right to apostasy, they could far more easily accommodate heresy. But human nature being what it is, this seemingly reasonable expectation while making ample theoretical sense, simply fails to reflect the reality of the matter, because it fails to factor human psychology into the equation. People are more often willing to accommodate the extreme position of apostasy exactly because they don’t want, or simply cannot bring themselves to, accommodate the middle-of-the-road views deemed as heresies. People who uphold heretical views are a major cause of confusion for the faithful, because they appear both similar and different. That is, they say some of the same things, but not always, and they often put some new and different twists on things, and on their interpretations of traditional view and doctrines. For this, they are often viewed as corruptors, therefore, as much more dangerous than those who left the camp altogether, becoming drifters and outsiders, and adopting another ideology or worldview. It’s the heretics far more than the apostates who are often viewed as the source of danger by the faithful. Apostates seem more honest, somehow, but heretics are seen as disingenuous and even as fifth columnists. Being an apostate who advocates the right to heresy with this clarity of perspective puts me in a category of my own, as far as the faithful are concerned, irrespective whether the faith involved is religious of political in nature, a category reserved for the most hated and vile from their perspective. Posted on 18/06/2014 25/05/2016 by AmmarPosted in Activism & Advocacy, Americana, Heretical MusingsTagged Dissidents, Heresy, Identity Politics, Islamic Reformation, The George W. Bush Administration, The Obama Administration, United States. This website is meant as an archive of Ammar Abdulhamid’s nonfiction writings in English for the period 2000-2015. Ammar’s more recent writings can be accessed at The Daily Digest of Global Delirium and The Delirica (English) and on Hartaqah (Arabic). Daily coverage of developments related to the Syrian Revolution for the period March 2011-June 2013 can be found at the Syrian Revolution Digest blog. Other websites dedicated to Ammar's work include: The Amarji Art Studio, The Cauldron, The Irreverent Activist, The Voidman and A Damascene Tapestry. Ammar on Amazon Ammar Abdulhamid’s works currently available on Amazon. Syria: A Fire Within Syria: A Fire Within explores Syria’s revolution from the vantage point of a seasoned activist and dissident, Ammar Abdulhamid. Tharwa Foundation Tharwa was established by Ammar Abdulhamid and Khawla Yusuf in Syria shortly after the events of September 11 to focus on inter-communal dialogue in Syria and beyond. 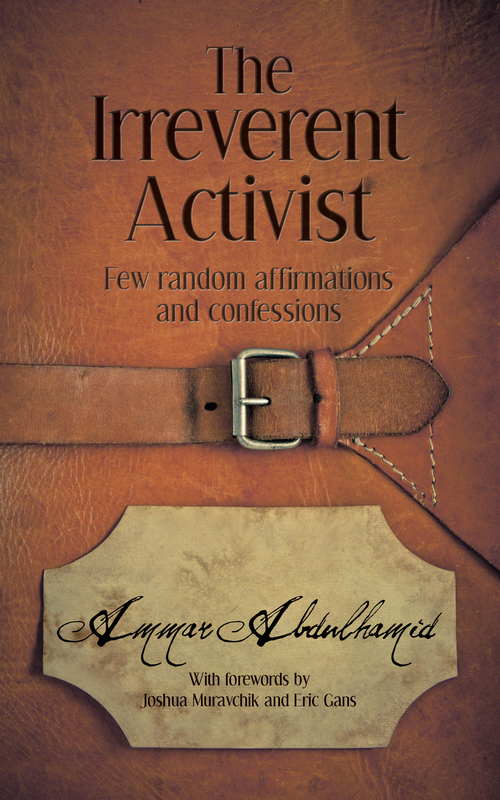 The Irreverent Activist A website dedicated to Ammar’s book of the same name. For modes of sharing, please contact the author. This website is dedicated to the writings and works of Ammar Abdulhamid.